This cabinet card features a young woman with a flair for fashion. She is most certainly what we call today, a “fashionista”. She looks absolutely beautiful. Her checkered dress is pretty, and unusual for this era’s photographs. I do not know what she is wearing around her collar. Is it part of her dress, or is it an accessory? The young lady is beautifully posed and has a magnificent smile. The stemmed flower in her right hand is a nice touch. The talented photographer of this image is Franz Stulz. He operated a studio in Lundenberg, Germany. This cabinet card photograph is in very good condition (see scans). The pretty young woman seen in this vintage real photo postcard is wearing a flashy striped bathing suit. This fashionista accessorized her bathing suit with a large matching hair bow. It was published by “NPG” (Neue Photographische Gesellschaft). The company was a leading bromide photo printing company for many years. The stamp box of this particular postcard has an interesting story. “NBC” (Neue Bromsilber Convention) was price cartel established in 1909 that continued until the 1930’s. The purpose of the cartel was to ensure that the minimum price charged for postcards was kept at a sufficiently profitable level. A number of postcard publishing companies joined the cartel in an effort to stave off the effect of competition on the pricing of postcards. This postcard is part of a series (no. 7194/5). The postcard is in very good condition (see scans). This cabinet card portrait features a pretty fashionista photographed by an unknown studio. Perhaps this young lady is a theater actress. This image is consistent with the work of Napoleon Sarony, Jose Mora, and other New York City celebrity photographers. The photograph presents a profile view of this attractive woman. ADDENDUM: Someone has identified the woman in this photograph as actress May Fortescue. See the images below of Miss Fortescue and see if you agree with the identification. I definitely agree. May Fortescue (1859-1950) was an actress, singer and actor/manager during the Victorian era. She was a protegee of playwright W. S. Gilbert. At age 22 she was a member of the D’Oyly Carte Opera Company for two years. She left the stage after becoming engaged to an English “Lord”. Friends talked her fiancee out of marrying the actress and he broke off the engagement. Fortescue sued him for “breach of promise” and was awarded ten thousand pounds. After her break-up, she returned to the stage and appeared in many leading roles. She acted until 1926. Photographer James Alba Bostwick of New York City photographed this cabinet card portrait of a well dressed couple. The gentleman looks quite austere in his long coat and derby hat. The young woman has a very engaging expression. She is wearing an interesting hat, fur trimmed collar and sleeve cuffs, as well as gloves. Note the ruffle bottom of her skirt. She definitely has earned the title of “fashionista”. To view other photographs by this photographer and to learn more about him, click on the category “Photographer: Bostwick”. A pretty young fashionable lady poses for her portrait at the Hopkins studio in Palmyra, New York. She has a large spray of flowers pinned to her lovely dress. She is wearing a ring on each hand and a pleasant half-smile on her face. The photographer of this wonderful fashion image is Alfred C. Hopkins (1852-1940). He listed in the “Village of Palmyra Residents Directory” (1901-1902) which lists his gallery address as 81 Main Street. He provides a testimonial for Eastman’s Solio Photographic Paper (made by Eastman Kodak) in “Pacific Coast Photographer” (1894). Hopkins was born in England. He was married to H. Clara Hopkins and was widowed and retired by the time of the 1930 census. Interestingly, the first reference to Hopkins as a photographer was found in an 1869 city directory. He was only about 19 years old and was clearly a pioneer in the field. Hopkins died in 1940 and is buried in the Palmyra Cemetery. 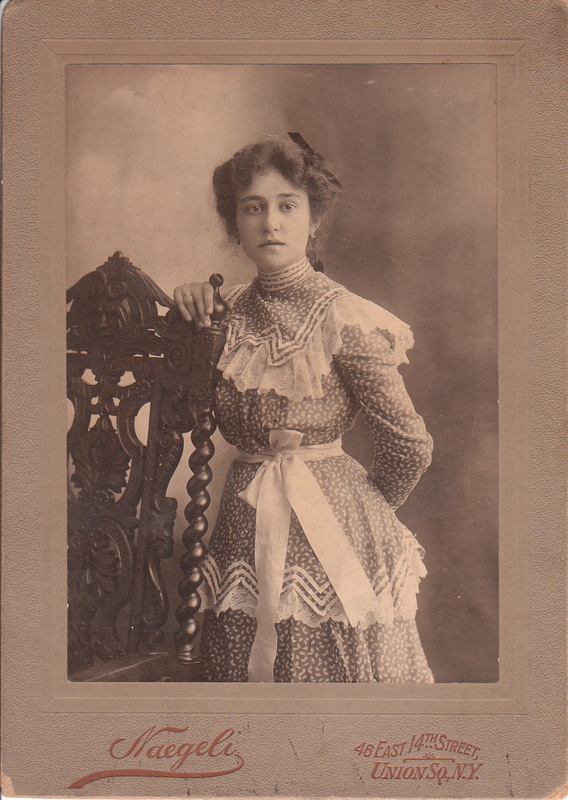 This cabinet card features a very pretty and very fashionable young woman. She is wearing a beautiful beaded dress and a couple of bracelets, earrings, necklace and ring. She certainly had fashion sense and wore clothing well. The photographer and the location of the studio are not indicated on the cabinet card. However, there is an inscription on the reverse of the image. The initials “GSR” and the name “Mary Wood” provide some clues to the identity of the woman. Also written on the reverse of the card is the year “1881” which is clearly the year that this photograph was taken. This photograph features a pretty young woman in a beautiful dress. She has a nice figure enhanced by a corset. She is wearing a ring and earrings. This image could be placed under the categories of “fashion” as well as “beautiful women”. The photographer is Albert Naegeli (1844-1901) who operated a photographic studio in New York City’s Union Square. Naegeli was a native of Germany who came to the United States at the age of sixteen in 1860. He settled in New York City. He began his photography business in New York City in 1864 during the CDV era. He moved the business to the 46 East Fourteenth Street location in 1876. He partnered there with Edward M. Estabrooke who was a tintype expert. Their partnership ended in 1880 and Estabrooke relocated to Elizabeth, New Jersey. Naegeli trained his sons Albert (photographer) and Henry (Technician) in the photography business. Naegeli specialized in portraits of theater stars. The subject of this photograph could very well be an actress of this era. Naegeli was a smart businessman and invested wisely in Real Estate and became a very wealthy man. The cause of his death remains a mystery. He died from a gun shot wound to his head. His son, Albert, claimed that the death was accidental but others thought that he committed suicide because he was depressed about the recent death of his daughter from a spinal disease. Whatever the reason for his death, New York City lost a talented photographer at the time of his demise. The photograph above is an example of his acumen. The format of the photograph and advertising beneath the image is identical to photographs that Naegeli took in 1899, indicating that this photograph dates back to around that year. The photograph measures 5″ X 7″.The image is sharp.